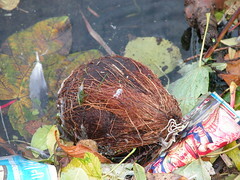 The combination of leaves, a coconut, brightly coloured hindi magazines and assorted flotsam from the 21st century made me think of Ian McDonald's wonderful River of Gods. Though this wasn't the turgid, turbid Ganges flowing down from the Himalayas. Instead, this was Old Father Thames at Kingston. To paraphrase Purnelle and Niven: "Think of it as globalisation and multiculturalism in action." There's something about coconuts. They keep turning up in my local park (northern Manhattan), though we haven't been getting the Hindi magazines.